about YOUR BUSINESS and YOUR SUCCESS, not just about our success. We won't nickel and dime you out of every feature we offer. We don't charge you for training seminars. We won't form partnerships with companies like SPA FINDER and force you to take their GIFT CERTIFICATES. We care because School Empower is technology that we developed with Dance Studio owners and, like studio owners, we are passionate about delivering the BEST, EASIEST and most AFFORDABLE technology we can. about our community. We are passionate about others who don't have what we have. That is why we are donating $2 every month from our subscribers to THE COVENANT HOUSE: an organization that helps homeless teens have a life. These teens are abused, living on the street and are hopeless. I have visited and been involved with this organization for two years and the work they do is nothing short of miraculous. In this day and age, where our kids are fortunate to have the opportunites to dance, we feel it is important to help those kids that don't. For every subsribers we have, we donate $2/month. for only 1000 subscribers, that's $24,000 per year! Besides food and shelter, Covenant House educates, trains, and helps teens live a productive live, many of whom go on to work at Covenant House helping other homeless teens. After we reach our annual goal of $25,000, School Empower will start a scholarship fund for our dance studios neediest. We want all our dance studios to be able to offer needy children in their area a chance to experience a year of dance class. At the end of the year, each studio will let us know they want to participate in our scholarship drawing, and we will provide $500 scholarships to as many studios as we can. Studios will be selected from a random drawing on or about December 1. School Empower was built on the newest web technology with world class design influence. We are the most intuitive school management system in the world. We were built for people without a technology background, so that you can spend less time learning technology, and more time doing what you want to do: teach. We are rolling out these features so that we can be sure that we have all the requirements for each one and that all our code is stable. School Empower is built with a full homepage, images and logos so if you can't afford to have a website, or don't have the time to manage a website, you don't need one. 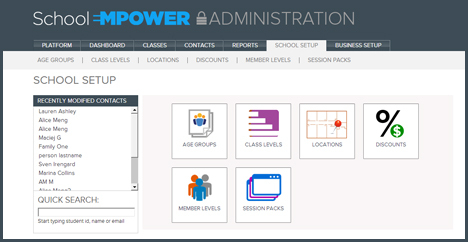 School Empower's homepage can look exactly the way you want it to with your class photos and logos. You can completely customize your semesters, ages, levels and categories. Offer semester based or drop in classes. Many types of discounts and session packs are available. Create your own. Combine them. School Empower is flexible and EASY to set up based on your studio business model. No other school management system has the ability to add teacher and class photoes, teach and class descriptions. School Empower makes it easy for your students to find the perfect class and enroll online. If you don't want online enrollment? No problem! You can easily disable that feature. 47% of consumers confirm they use their smartphone to search for local information such as a local store they want to visit. 46% of consumers look up prices on a store’s mobile site, and 42% check inventory prior to shopping in the store (Source: Local and the e-tailing group, 2012). Nearly two out of three shoppers use at least one device to research and purchase while shopping, and 28% use two devices at a time. Tablet shoppers have an even higher propensity to make a purchase on the device with one in four having purchased six times or more in the past six months (Source: Local and the e-tailing group, 2012). 62% of shoppers search for deals digitally for at least half of their shopping trips (Source: GMA/Booz & Company Shopper Survey). If you'd like a trial, sign up for a $1 for 1 month now!